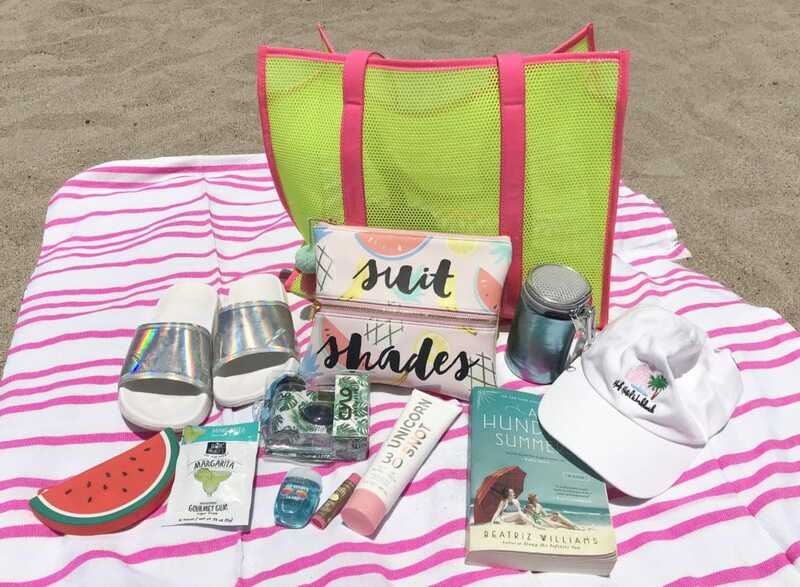 Whether I’m headed to a local beach here in Los Angeles County, or preparing for an exotic vacation somewhere far away, my summer beach essentials help me to have the perfect day. I recently vacationed in Puerto Vallarta, and before I left I started to think about what I would need. Being a lover of street style, this cover up was the first item on my list. The mesh material helped to keep me cool in the hot and humid 90+ degree days. I love wearing white in the summer as it shows off my tan. I then worked the rest of my outfit around it; the bikini, slides and earrings (which I sadly lost). I pulled a pair of $1 sunnies out of my closet that I bought on Hollywood Blvd years ago. The outfit was finished, but I now needed a beach bag to complete the look. I ended up choosing a neon mesh green tote bag and filled it with things I would need for a fun-filled day in the sun. Read on to see what I choose. I wanted to make sure that my beach bag would match most of my swimsuits and cover ups and since I’ve been obsessed with bright neon colors lately, this Current Mood beach tote really stood out. The size is perfect--not to big and not to small, and it can easily hold all of my necessities; a towel or beach blanket, flip flops, and whatever else I may need for the day. I was on the hunt for a pouch to hold all my little necessities but I wasn’t having any luck in finding one since it needed to coordinate with my beach bag. The day before I left for vacation, I stopped at Nordstrom Rack and found this Design Clique pouch. It’s waterproof and made of sturdy vinyl. The fruit design is cute and colorful and the pom poms give it a little something extra. It has two zippers: in the larger area that says “suit”, I put my wallet, sunscreen, book, and camera. In the area that says “shades”, I put my smaller items like my sunglasses, earbuds, chapstick, hand sanitizer, and gum. Having this in my beach bag ensured me that nothing would get lost, and that I would be able to find whatever I was looking for without having to search. When I’m near water, sand, and suntan lotion I need something that's going to protect some of my most important items--money, license, keys, and credit cards. This watermelon change purse from Dolls Kill is adorable, and it’s waterproof! Every summer I say to myself, I wish I had something that would keep my drink cold. This year, I decided to purchase a Koolzie and I’ll never go in the sun without it again. Red Bull is my go-to drink so I was worried that the Koolzie would only hold a typical sized soda can, but luckily it held both and kept my drinks cold for hours. I bought this beach blanket that doubles as a towel in a little boutique in Sayulita Beach, called Revolución Del Sueño. This colorful shop carried things like jewelry, handbags, postcards, stickers, and Las Bayadas products. In the United States these towels retail for around $48, but in Mexico it costs only $7! I’m obsessed with all things holographic, so when I saw these Ban.do slides I had to buy them! They’re extremely comfortable, they go with everything--from a beach cover up, to gym shorts...and they certainly stand out. A hat to block out the UV rays is at the top of my list. There are so many options when choosing which kind to buy; boater, straw, fedora, panama, baseball caps, and sun hats. I decided to purchase this white “dad hat” by Huf because it compliments my beach cover up so well, and being a neutral color it can be paired with so many things. There’s nothing worse than a sunburn on your lips! My go-to for protecting my lips is SPF 30 chapstick by Sun Bum. They have so many amazing products and flavors like pina colada, ocean mint, pinkini, and bonfire. I ended up choosing watermelon which tasted so good I had to keep applying it. Sparkles + sun rays = a glistening tan. I love how this SPF 30 sunscreen by Unicorn Snot made my skin shimmer from miles away, and it still offered me the right amount of protection. It comes in three holographic colors; pink, blue, and gold. I choose pink since it’s one of my favorite colors, but I can’t wait to try the other two. One of my favorite things about summer is sitting on the beach, listening to the waves crash, and getting lost in a good book. In my everyday life I don’t have a lot of time to read, but I make sure that when I’m on vacation I disconnect from the world and set aside some time to do so. It's a tradition for me to buy a book before my vacation and start reading it as soon as the flight takes off. For this vacation I choose A Hundred Summers and I couldn’t put it down. Here’s a list of some of my other favorite beach reads that I’ve read throughout the years. When I was younger I used to buy a disposable waterproof camera every summer, and then I’d look forward to September when I’d get the photos developed. They’ve come along way since then. I love that Cylo has so many cool prints that you can match to your beach bag or swimsuit. When I think of summer I think of sipping margaritas on the beach, so Project 7’s Margarita Gum replaced the typical mint flavors I would normally use. Everyone that knows me knows I never leave my apartment without a Bath & Body Works hand sanitizer. Before my vacation I stocked up on their summer scents; Fiji White Sands, Resting Beach Face, and Coconut Colada. Whether I'm sightseeing or relaxing on the beach these sanitizers always come in handy. What are your summer beach essentials? Comment below!